Thank you to all who joined us at our carols service and thank you to all who assisted to make the evening a success. Guest performers included: SATB (a saxophone quartet), Miss Cathy-Jane Mintoor (choir conductor of the junior and senior choir and a Riebeek teacher who joined us from Drakensberg Boys’ Choir School at the start of 2016), New Apostolic Church Wind Band,“The Holy City” conducted by René Zietsmann. Congratulations, Miss Mintoor, juniors and the senior choir. 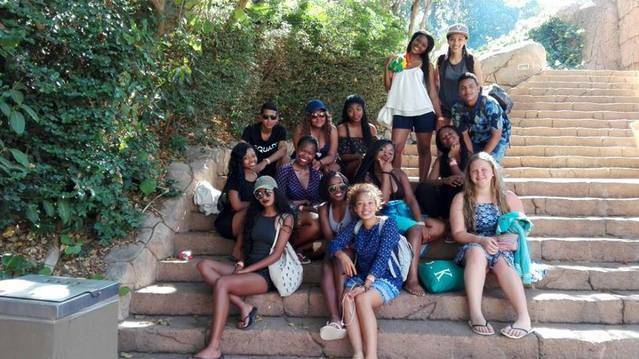 All the excitement and fun of the Kruger Park Tour! Thank you to Mrs Ferreira for accompanying the girls. 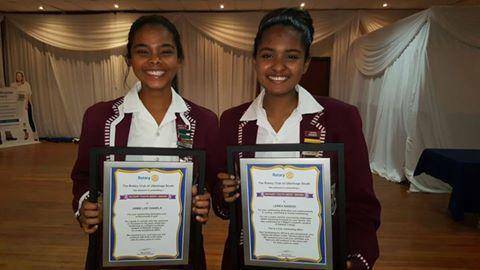 The Rotary Club of Uitenhage South have recognised two Riebeek College Girls’ High School learners at the annual Rotary Youth Merit Award Ceremony of 24 October at the Uitenhage Golf Club. 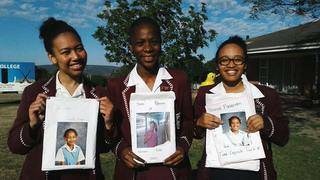 The two learners are Lenae Naidoo, Grade 12, and Jamie-Lee Daniels, Grade 11. Lenae Naidoo has epilepsy but still competes in cycling. She has demonstrated true compassion as a First Aid Committee member, school prefect and deputy head of SPCA. In among these commitments she played first team hockey too. • Entered the Makro road race 30km on 10th September 2016 and came in as the first female in the Open category with a time of 1:18:09. • Cycled The Herald 2016 106km in 3 hours and 54 minutes. • Female Swimmer of the year in Dolphin Triathlon Club 2014 and 2015. • Finished all cycling races 1st in her club – Lenae said, “This was seen as a big achievement as I am the only girl. • Muir Gala February 2016: Lenae Naidoo, Samantha Jones, Mateenah Langford and Desire Ferguson swam against the Muir team in the annual Ashes race. 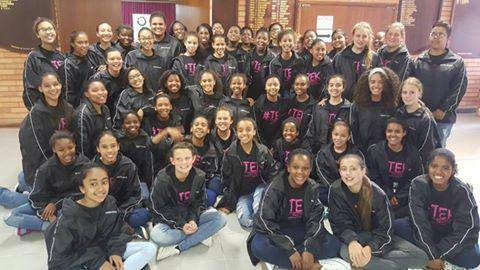 Mrs Myburg is very proud of the Riebeek team who swam well and gave it their all. • July 2015 - Lenae Naidoo in Grade 11 was the first under 18 - competing against fellow male and female racers - to complete the 50 km bike race in the Knysna Cycle Tour on 5 July. • On 21 October 2015 Natheera Sirkhotte and Lenaê Naidoo (Head and Deputy Head of the SPCA Committee of the high school) handed over a cheque to the SPCA Uitenhage and District Branch at a special assembly. 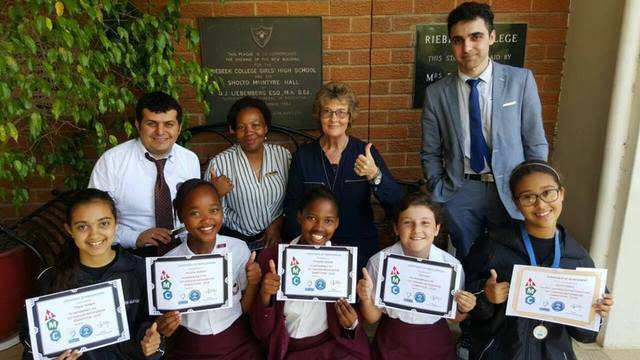 The annual cheque amounted to an amazing R20 600.00 collected through raffles, colouring-in competitions, cake sales and civvies days which are well supported by the enthusiastic learners of Riebeek who have a sense of community responsibility, compassion, empathy and a huge love of our furry friends. 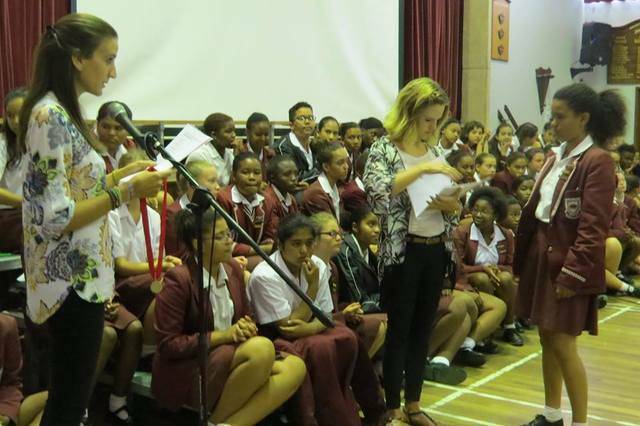 • August 17, 2015 · Sports Assembly: Miss Potgieter, teacher in charge of hockey, led a special sports assembly today with the powerful message about confidence, not being limited by the sometimes insulting phrase "like a girl" and being inspired to be active. Hockey and tennis badges were handed out., Lenae received a hockey badge. Jamie-Lee Daniels is an Eastern Province Golfer. 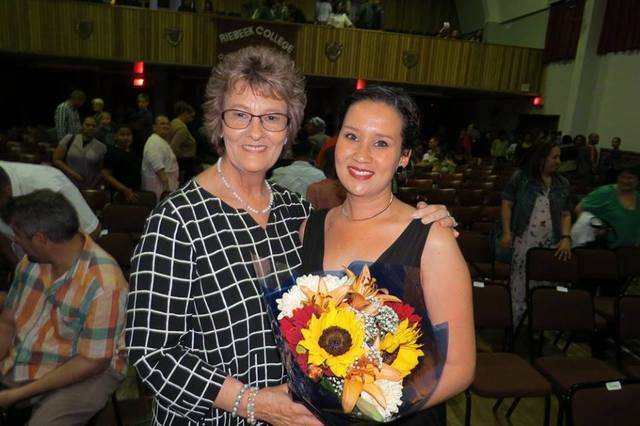 Riebeek College’s very own golfing super star, Jamie-Lee Daniels (17 years old), has shown that hard work and dedication does pay off. After a highly contested final she won the Plate Division final at the Sanlam SA Women’s Amateur Championship at Ebotse. This fantastic achievement was not the result of simple luck. Jamie-Lee has devoted many long hours of strenuous practice to the game she loves while still being involved in school life, A team under 16 Hockey and somehow finding time for her school work. Jamie-Lee plays for the Uitenhage Golf Club. She started playing golf at the age of four. She was inspired to do so after watching her dad and sister play golf. Thirteen years later she continues to play the sport she enjoys and devotes two hours a day practicing and perfecting her game. On top of all this arduous work she has had a full golf programme throughout the year. February: Eastern Province Championship at Humewood Golf Club; tied 15th place. EP Closed Competition; 1st place (best EP player). Border Ladies Championship at East London Golf Club. March: Curro SA Junior International at Langebaan Country Estate; tied 13th place. SA Rose bowl u/18 at Port Elizabeth Golf Club; 27th place. July: Gauteng North Championship at Woodhill Golf and Country Estate; lost in 1st round of match play. It was during Jamie-Lee’s July golfing programme where she competed in the SA Women’s Amateur Match Play at Ebostse Golf and Country Estate. She lost in her 1st round of match play, this put her through to the Plate Division. However, this was the last time she would taste defeat. She came back with vengeance, determined to take home her prize. She beat three other opponents in match play rounds and finally played Zayb Fredericks, on the national rankings, in the final. The competition was fierce, but of course our fiery Jamie-Lee didn’t let it faze her. She held on to win the last hole and take home her well-deserved trophy. August: Eastern Province vs Border Championship at Port Alfred Country Club; finished 9th in the strokeplay A division consisting of 32 players. October: Captained the EP Senior Women’s Team at the Interprovincial Tournament held at Umhlali Country Club in Durban, Ballito; the team finished second in their matchplay division. For a game predominantly played by men, Jamie-Lee’s achievements are no easy feat. 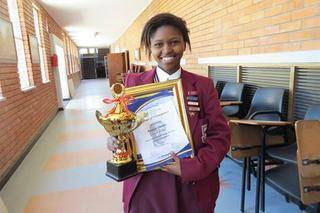 Her achievements are remarkable for any woman, even more so for a seventeen year old who is still trying to juggle her school life and other commitments..
Omhle Bissett in Grade 10 represented the Uitenhage District as a provincial representative at the national round of the Nkosi Albert Luthuli Oral History Project Competition. She presented her project on multi-culturalism at Riebeek today at Freedom Park, Pretoria. Thank you to her parents for supporting her at the presentations. The grade 12G class opened their grade 9 time capsules they made in 2013. The morning was filled with laughter and good memories and the class thought this quote was very befitting : "it's the oldest story in the world. One day, you're 17 and you're planning for someday. And then quietly, without you ever really noticing, someday is today. And then someday is yesterday. And this is your life." As the end of primary school approaches, the Grade 7s celebrated the new Grade 7 jacket. 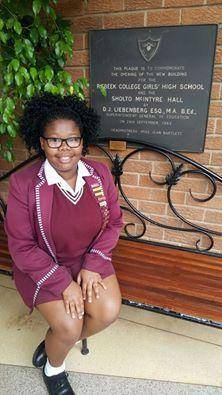 Ambesa Daniels has been selected to attend the 58th Jeugleierskonferensie of Die Burger WKOD in Muizenberg from 9 to 15 December 2016 in Cape Town. We are very proud of this wonderful achievement. The theme for the conference is, "Etiese Leierskap vir 'n Beter Suid Afrika." After an exquisite border banquet in Mrs Woods' honour last night, Mrs Woods was the centre of attention at school today when the end of term assembly became a surprise assembly. 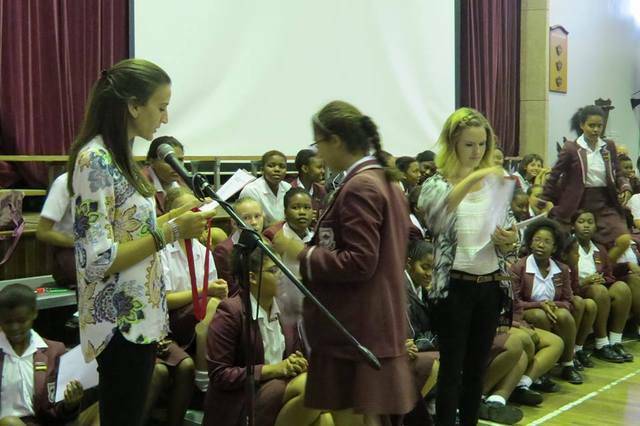 Past headgirls and Zoleka Mtila (Class of 2010, The VoiceSA contestant) serenaded Mrs Woods as did Lemley and our ground staff, learners, Mrs Elie with musical accompaniament by Miss Mintoor, groups of girls in the hall with staff members dressed in school uniform who had learned to play musical instruments for the event. Mrs Stevens and a group of Grade 10s had shakers. Mr Calitz and a group performed on electric guitars. Mrs Hickson and some Grade 9s were on drums. Mrs Skeates and group of Grade 4s were on triangles (with some extra pots and spoons to increase the sound). Mrs Myburg did a musical bridge with two girl drummers on stage. Trumpets and trombones were Robyn Cloete, Mrs Stear and a group. Recorders were Grade 5s. 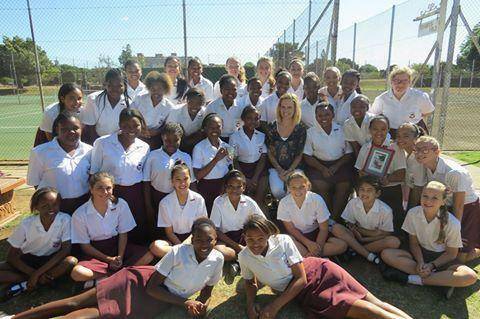 Tamborines were Miss Potgieter and her hockey girls. Bells were Mrs Kruger and a group of Grade 8s. Violins were Mrs Stark, Carleen Braun and friends. Grade 10 choir did a beat box verse and Grade 11 and 12 choir started off the song from the gallery.The song "All you need is love" filled the hall. Mrs Woods was then escorted by her bodyguards (Mr Reynolds, Mr Weidemann and Mr Jonas) to her couch in the hall where Mr Calitz serenaded her with her favourite songs and he received a standing ovation from Mrs Woods, Yolanda Mni (Class of 2015) delivered a brilliant speech on Mrs Woods' contributions to Riebeek, the staff and the girs; and Siviwe Tole (Class of 2016) gave an awesome talk on the fruit of the spirit, a tribute video was played with photographs and clips of the girls commenting on Mrs Woods. Mrs Woods was escorted out of the hall by her bodyguards to Mango Groove's Nice to See You and a guard of honour was formed to the student centre with bunting featuring flags printed with photographs of Mrs Woods. She was given gifts along the way to make up a mosaic set for her retirement hobby and a puzzle compromising hundreds of photographs of her. 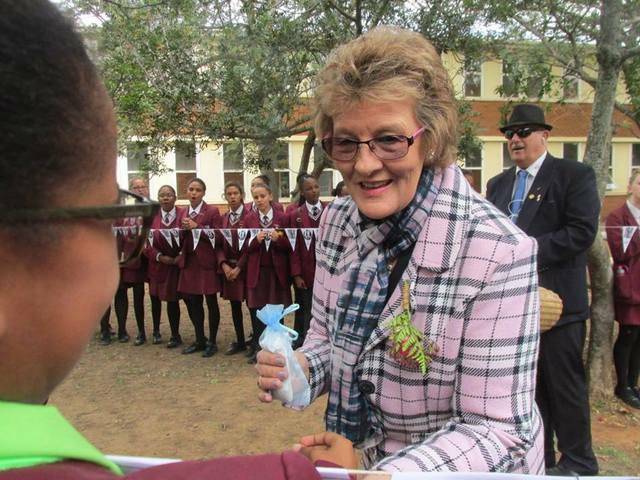 Mrs Viljoen and her team outdid themselves with the guard of honour arrangements and gifts. She then enjoyed tea with the old and new senior prefects and the junior prefects. Thank you to the prefects' parents for their contributions to the tea - you all outdid yourselves with a delicious spread. Code Name: Operation Love - Over and Out - the eagle has landed - Mission Accomplished - a feel good day! Well done, girls and staff and Old Girls! 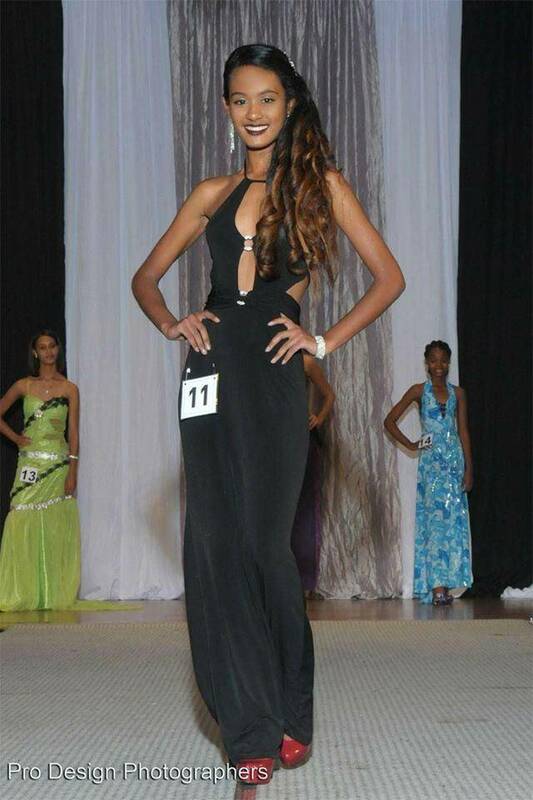 Lara Naidoo tells us about the Miss High School SA Pageant: I am currently a semi-finalist in the Miss High School SA pageant. I am very excited and quite nervous. I'm sure it's going to be an amazing experience. I am looking forward to the challenges if I should win this title and to be an ambassador for high school ladies. Thank you to everyone who has been voting and please continue to do so on a daily basis until the end of November.